There’s never been a more exciting or more challenging time to be a marketer. Customer expectations are changing by the minute, meaning marketers have to be on the ball to keep up with new ideas. How can they help their companies grow while still keeping their brand current and relevant? According to Sally Jenkins, CMO of Informatica, the key is to understand the customers and always be looking forward to a new opportunity. Sally shared her experiences leading a recent rebrand at Informatica. Rebranding is about much more than just changing the logo — it is a chance to make sure messages and goals match what customers want and expect. While a full rebrand doesn’t need to happen on a regular basis, companies should constantly be testing their messages with customers and honing their communication in an ever-changing world. The first step of a rebrand is to understand what customers are saying about the company. This can be done with surveys, events, or break-out sessions to get a better understanding of what customers feel about your company and where they are in the customer journey. This information gathering should be open and honest — it acts as the basis for your updated brand, so information that isn’t completely accurate could lead to ineffective results and a brand that isn’t truly aligned with what customers are looking for. The end goal of the first stage of rebranding is a complete understanding of where customers are and where your company can take them. From there, companies need to synthesize the information and combine it with other data to find a way to translate what the customers want to the company’s messages, look, and feel. This is where the brand identity is created and when the visual aspects of the brand are connected to goals and vision of the company. 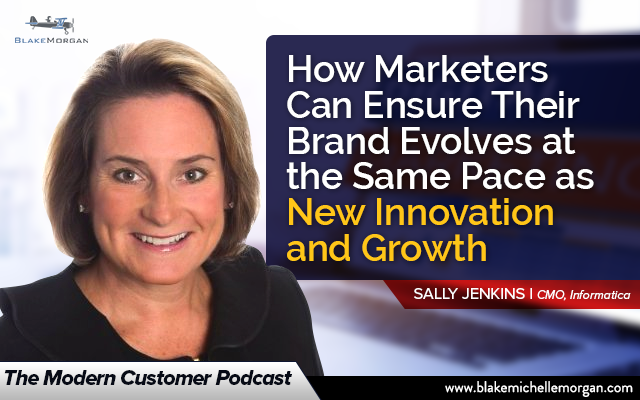 Sally stresses the importance of first launching your new brand internally with employees. By thinking about employees as your first customers, you can help employees realize how to use the company’s values in the decisions they make at work every day. Once the employees are on board and understand the updated brand, the messages can be spread to external customers for a cohesive customer experience. Rebranding is something that needs to be thought about on a regular basis and continuously adjusted as the needs of the company and its customers change with new technology and ideas. One of the best ways to do this is to use data for predictive analytics. Combining the science of data with the art of marketing helps CMOs and their teams stay on top of trends and lead the charge for innovation. In the ever-changing marketing world, data helps companies make informed decisions about effective ways to reach customers. To truly keep up with innovation and growth, companies should always be proactive and find ways to disrupt the status quo. In a world where customers where define your brand no matter what, it’s up to the marketers to take charge and help set the narrative the reflects your true brand.